Hytrol Conveyor Company's first conveyor, designed by founder Tom Loberg in 1947, moved bags of seed in preparation for stacking, and folded when not in use. Loberg discovered that the right angle reducer he had designed for a rotary lawn mower was just the right size to make a belt run at the proper speed on a conveyor. 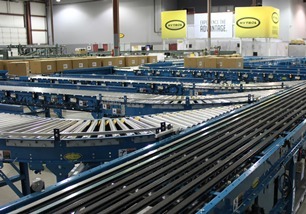 According to Material Handling Equipment Distributors Association (MHEDA), the only trade association dedicated solely to improving the proficiency of the independent material handling equipment distributor, conveyor systems have been an integral part of material handling for more than a century, and transport of bulk materials by conveyor belts dates back to around 1795; the vast majority of these early iterations were used to move grains over very short distances. The first conveyor belt systems were very primitive and consisted of a leather, canvas or rubber belt traveling over a flat wooden bed. This rudimentary system was successful enough to provide incentive for engineers to consider conveyors as an economical and efficient way to haul large quantities of bulk material from one location to another. By the turn of the 20th century, conveyors were being used in the Minneapolis-St. Paul area to unload wooden shingles from railcars. Conveyors are now used for thousands of additional applications, particularly moving items in manufacturing plants and distribution centers. The historical perspective is easy to grasp. Automated product movement is a well-established, easily understood concept. It is so familiar and normative that many in the material handling sector consider conveyance technology little more than a commodity. That is a wild over-simplification. Conveyor solutions are developed from dynamic and complex challenges which require safe, ergonomic, tested and proven products, developed by creative people with a focus on lean manufacturing continuous process improvement. Designing an automated conveyance system on paper lacks the kind of rigorous testing needed to ensure that post-installation the technology solution works the way it was designed and intended. Few organizations have an internal testing system. Based in Jonesboro, Arkansas, Hytrol installed a test system at their Technology Center, allowing customers and integration partners fully test products prior to implementation. This unique resource provides a level of confidence and reassurance to customers. 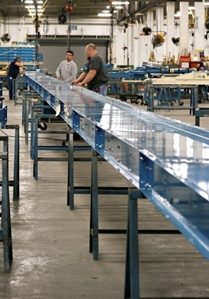 All issues and workability concerns are addressed before conveyors are at the customer plant floor. Until very recently service was a major determining factor in selecting Motor Driven Roller (MDR) equipment. Providing the best 24 volt conveyor drive technology globally is another way to assuage material handling and manufacturing concerns. E24, 24 volt (MDR) conveyors are being widely used due to their simplicity and flexibility. Since the drive train is distributed along the conveyor length a single piece of equipment can perform multiple functions. This includes different speeds, multiple directions, and starting/stopping individual sections. This breakthrough E24 technology is unique among conveyor providers and the modular design allows for easy configuration with minimal maintenance. The safe, quiet, and energy efficient operation offers greater speed options because the conveyor speed is not based on fixed gear ratios. Since one motor is used for all widths and speeds, there is only one motor to stock. The minimum conveyor width is not limited by drive components and multiple motors per zone are available for long zones. Designing and manufacturing for major companies all over the world, Hytrol made clear that these are some of the most advanced conveyor systems in the material handling industry. More than 700 dedicated employees consider themselves a member of the Hytrol family. It is this cultural context that evaporates the notion that these conveyors are a commodity. The products and services represent personal integrity and dynamic lean thinking. Bob West, Vice President of Corporate Development at Hytrol extended the values of the organizations and noted, "Strong relationships build success. A key component of the Hytrol Advantage is the success of our integration partner network, which is focused on bringing you the best solution. With more than a hundred locations around the world, Hytrol's network of local service providers offers you great piece of mind. Through our strong relationships, Hytrol is able to provide local presence, on-site expertise, and the instant assistance needed by customers today." This sentiment was echoed by Matt Farris, Director of Business Development at Hytrol who remarked, "Our integration partners are experts managing the total project with best-of-breed software and equipment. They go beyond just selling equipment and explain how our system solutions can improve your methods. They work hard to develop a deep understanding of each customer's business in order to recommend the right solution every time." An integration partner can be on a job site at a moment's notice. They work with end users to make sure that they understand the system. Strong integration partners integrate conveyor equipment with other technology to fit the customer's needs. Local integration partners know local codes and they understand local law providing conveyor. They are familiar with customers in that area; they are neighbors. The real relationship is at a local level, which makes them accessible anytime the customer needs them. From concept to implementation the integration partner network is a unique business model that allows heightened customer service. Lean manufacturing is a comprehensive approach to preserving value, from concept to completion. Lean manufacturing is infinite and ever evolving. Chris Glenn, Hytrol's Vice President of Manufacturing and Engineering Operations emphasized the importance of lean manufacturing and urged, "Lean principles are at the core of everything we do here at Hytrol. It's a unique way of thinking, a philosophy built on efficiency that offers the most value to our customer." The execution of best-practice and continuous process improvement was articulated by Chris Taylor, Focus Factory Manager at Hytrol. "It's all about how the product flows through the facility. It's about problem solving and streamlining processes to improve production and eliminate waste. We implemented lean principles into the Hytrol facility in 2004, and we've never looked back. It's ingrained in our culture." Few conveyor companies have been as wise to build the entire enterprise around operator-centric processes. An operator brings value to the manufacturing and assembly of a product that a piece of automation does not always provide. Every Hytrol conveyor system is geared toward supporting that operator and getting product out the door. By continually investing in people, the is a customer competitive advantage driven by these cultural imperatives. The most important thing about fulfilling a customer's needs is the total solution. Putting all of the technologies together with the correct controls and the applications ensures a total system and promises that the implementation goes as smoothly with integration partners. This conveyor culture creates a collaborative experience among the manufacturer, the end user, and the integration partner. The concept of conveyance is easy to grasp; the execution of great conveyors indeed rests with centers of excellence, supported by comprehensive testing, knowledgeable partners, and creative and passionate people. The conveyor culture modelled at Hytrol illustrates the dynamic requirements of manufacturing best practices.